A rabbit’s foot and a hoodie - It's All Over, Fat Man! Will John Fox be a good coach? Will he be a great coach? Will he be fired after two seasons? Rather than offer up a Kool-Aid-based opinion, in which I defend Fox as a turnaround artist and the victim of bad ownership in Carolina, I thought I'd let sheer randomness take a crack at the question. So let's start our own NFL. You've always wanted to do that, haven't you? Now, instead of being born an heir to the Johnson & Johnson fortune, you can just have a team. Yeah, I'm that nice a guy. Savor it. Why four seasons? Well, that happens to be a common contract length for a new coach. But who's counting, eh? After our first season, twenty of our teams miss the playoffs, and as we expected, twelve of our teams were drawn by fate for the postseason. For those keeping score, that's a 37.5% chance of making the postseason and a 62.5% chance of missing the playoffs. Should the fan base of each of these losing teams be upset? Unless your team drafted an oft-injured running back and traded back into the first round for an average corner, probably not. Remember, this is only the coach's first season. He needs time to implement his system. Perhaps the team was used to a culture of losing and it's going to take some time to turn that around. Even better, he's got to bring in his guy at quarterback. So the fan base cuts these coaches some slack. How about the teams that made the playoffs? Well, that's a different story. The fan base for these teams are joyous. They praise on message boards the change in the players' attitudes. If a particular coach ran an intense training camp, the media tells us he's given the players the requisite tough love. If he ran a light camp, we're told he's a player's coach. Perhaps one coach is even called "Mangenius." Depending upon the circumstance and team, phrases like "worst to first" and "turnaround artist" are applied accordingly. Oh, yeah, and don't forget, this is random. After our second season, another twelve of the teams make the playoffs. Some of them could be pulled from the previous year's winners, others from the group of non-playoff teams. This tree shows the first two completed seasons. In the second season, the twelve winners from season one have the same chance of either making (37.5%) the playoffs or not (62.5%). The same is true from our twenty losers from season one. So after two seasons of play, 4.5 of our teams have had two winning seasons. You can bet the fan bases of these teams are happy with their coaching choices. The General Manager and Owner are called "wise" if they hired coaches with a lot of experience. They are called "innovative" if they hired a hot shot coordinator with little experience. Fans want these coaches signed to an extension as soon as possible. 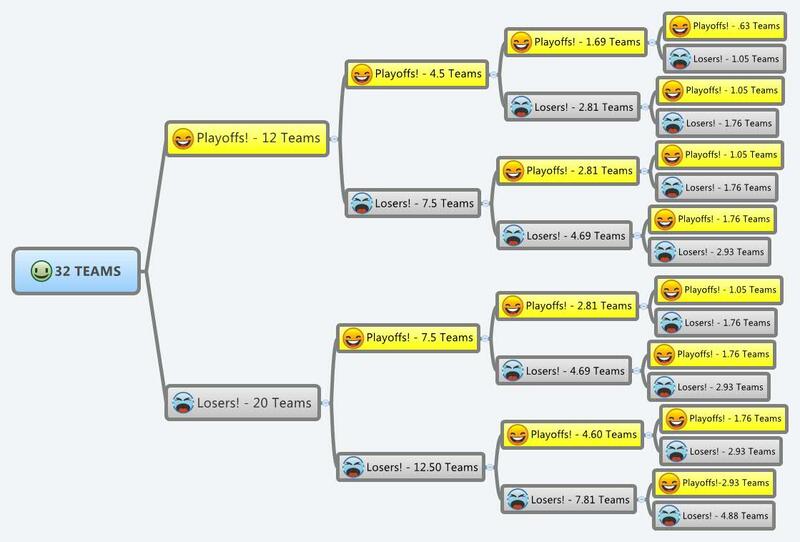 Fifteen of the teams in our league have made the playoffs once. The fan base of these teams are split. Message boards are filled with contradictory comments. Some of the comments call the coach lucky. Some say his true colors will show themselves in season three. But most of all, there is a call for patience. These coaches still need time to implement their systems, so goes the thinking. 12.5 of our teams have missed the playoffs two straight seasons. Their fans are not happy. The local writers for these teams are already whispering the words "hot seat." Fans booed at the last home game. If a coach for one of these teams ran a tough training camp, he's known as being rigid. If he ran a light camp, perhaps he lacks the toughness needed to be a great NFL coach. Again, I remind you, these seasons have been randomly generated. The two teams (if we round up) who have enjoyed three consecutive playoff berths are now creating nicknames for their coaches. Let's call one The Chin, since that happens to be his most prominent facial feature. Let's call the other The Mastermind. Why not? I'm sure (despite this being completely random), he was making some highly intelligent calls. If the owners of these teams haven't locked up these coaches to an extension, they are frantically trying to do it. Interestingly enough, the media begins to fill (post facto) on how these coaches have made all the right moves over their tenure. Perhaps the coach that is known as the Mastermind plans on writing a book telling all of us about these moves. Maybe he entitles the book Think Like a Champion. Eight of our teams have made the postseason twice. These coaches are not even close to the hot seat. They are being hailed as solid coaches and their teams, we are told, are just a few players away from making another run. Fourteen of our teams have made it to the playoffs only once in three seasons. Their fan bases (and ownership) are getting nervous. Are these coaches fit for their jobs? One of these coaches, the one who was labeled the "Mangenius" after a playoff appearance in season one, is not officially on the hot seat. A full eight of our teams have not made the playoffs even once. Screw them. They are terrible coaches. Ownership should quickly figure out a way to fire their asses and line them up for the next Raiders coaching vacancy. Did I mention this is all random? So after four seasons of randomness, in which teams all have the same chance of making the playoffs, only one team is left standing (if we round up) with four consecutive playoff appearances. I think we all know what would happen at this point. The media would take every quirk this guy had (perhaps he wears hooded sweatshirts with the arms cut off and speaks in vague statements) and turn it into gold. Books would be written about him. And other teams would try and copy everything they saw this man doing, despite the fact that it's totally random. Some other teams might accuse the guy of cheating, but after four consecutive playoff appearances, the trait would be shrugged off as the guy being a hyper-competitor. The four teams that had three winning seasons would be happy with their coaches. Extensions would be waiting. The teams that had two playoff seasons (10.55 of them) would be lukewarm. Their fans might wonder, "why is this guy so hot and cold?" The teams that had only one playoff season, which included the greatest number of teams out of the thirty-two, are unhappy and actively seeking other coaches. Many of them have been described as soft or weak. Perhaps there are accusations by the local beat writer that they don't toe the line with players the way that they should. Five of our teams (rounding up) have had four consecutive non-playoff seasons. They are currently out of a job. Ownership doesn't care that this was all random. The guy they called "Mangenius" was able to find work, however. He just went from one losing team to another. History books, autobiographies, and self-help books are written by and about the winners, often through the prism of survivor and confirmation bias. We see that a mutual fund has beaten the market for two years running, and we assume that the manager of this fund is skilled, not lucky. We rarely mention that previous to this, the market trounced the fund manager. We buy a stock. It goes up. We assume that our skill as a stockpicker is better than the average. Entrepreneurs who successfully IPO their company are featured on magazine covers and lauded for their appetite for risk. The other 1,000 whose company failed (and who also had appetites for risk) never make the cover of magazines. The same is true for sports. Despite that sports are complex and fraught with randomness over the course of a season, we like to think that luck equals preparedness plus opportunity. We we forget that all coaches in the NFL are prepared. Yet someone has to win. We can simply create the narrative and backstory later to justify the how and the why. So is John Fox a good coach? He might be. You can see his track record here. Just note that making the playoffs three times in nine years is no better or no worse than rolling dice. So unless you've got Tom Brady or Peyton Manning lined up, Fox stands a chance of being as good as the next guy the Broncos would have picked. I laughed thru the whole thing. Good stuff! Thanks, TJ. This one&#8217s a classic. Thanks, TJ. Dude! Dude, this reminded me of a study I did a few years ago (and that I need to update). The gist is that I took every coaching tenure from 1995-present (which was 2009 IIRC), gathered data on their tenures and categorized them as Successful, Moderately Successful, or Unsuccessful (it was mostly subjective). I then gathered some data on each type of coach and tried to see how likely it was that the 11 coaching hires made that year would succeed. Chances are, only 3 of them will be considered &#8220successful&#8221 in the long run, while over half will be unsuccessful. In fact, 4 of those 11 coaches have already been fired. Anyway, I can update the data and share it again if people are interested. I also completely agree with the idea that NFL coaches aren&#8217t given enough time. I think they need at least 4 years, which is the primary reason I was upset at McDaniels&#8217 firing. El-Erian is correct spelling, I believe. Nice article. I like the methodology that you used and agree that it serves to sound a note of caution to those who are quick to assign praise or blame to a coach. I would also venture to say that it does a lot to show that there are a few successful franchises who are operating far above what can be accounted for using a random probability assignment to each team (most notably the Eagles, Patriots, and Colts). Great comments. Yours are thought-provoking as well. Let&#8217s see. I would say to you that I&#8217m not assigning, for example, Warren Buffet nor Bill Belichick to randomness. I&#8217m not even assigning John Fox to that category, although the implication, as you observed, is there. Rather, I would make the observation that we ought to be very cautious and careful when assuming that someone is a great coach (as with Mangenius or the latest guy is Mike Smith) when a random sample can deliver similar results. Does it mean that Mike Shanahan isn&#8217t a mastermind? No. But I rather doubt it. I think his record would fall within a random sample. This is not to discount hard work and showing up on time and the usual stuff. Obviously one should do that. They are prerequisites for getting into the game (like a MBA for a Wall Street guy, for instance). Just proceed with caution when the media begins to create the back story for the survivors. They are often the same for the losers. I think your point about previous results is actually true. Of course, for this thought experiment, I needed to create an equal playing field. However, if I was applying my own standards of judgement, I would clearly want to know everything I could about the track record. Belichick is a good example. He&#8217s made the playoffs 8 out of 9 years now with a variety of players and teams. That&#8217s clearly above any random sample. I think you and I would agree his success is either one HUGE outlier or Black Swan or he&#8217s got skillzzzzzzz, my friend. Great stuff, sterto, as always. It is by making the exploration completely random that the point is made. If you wish to factor in ability, luck and whatever else influences the outcome, all you have to do is look at the actual real life records. It is the contrast between the two that is illuminating. If you were to throw in some of the factors you suggest, the enlightening quality of the result would be diluted. also, it probably goes without saying, but in case it&#8217s lost in my questioning: as always TJ, an entertaining and thoughtful article. i have a question and an observation. please bear with me, as i&#8217m not a stats guy. Question: is it appropriate to assume that the probability of making the playoffs is the same for all teams, regardless of prior success? i know you&#8217re trying to make a point with the random outcome, but you don&#8217t tie back the final distribution to the empirical performance of teams/coaches in the NFL. so for instance, if a playoff team has some intrinsic elements plus talent-attracting ability that make it more likely to make the playoffs the following year ... and vice versa for non-playoff teams, won&#8217t your distribution be flatter and have more outliers? so if empirical evidence shows that the actual distribution is broader and flatter, isn&#8217t that relevant because it actually counters your random dice throw argument and points to success factors? Observation: i have a problem with the basic premise that because you can fit me into a population so that you can assign everyone in that population an aggregate probability of success, that it necessarily follows that my individual success is random. although i try to avoid stockpicker analogies because i think the equity markets are all too often irrational, i will follow your example. just because, on a purely random basis, you must end up with a stockpicker with 10 straight &#8220outperforming&#8221 years, it does not follow that a buffett/gross/el arian/whoever was a product of random chance. if a closed set of stock buyer/sellers by definition have an AVERAGE outcome of 50%, that doesn&#8217t mean you&#8217re just as well putting your money with buffett vs a dart-throwing monkey. apologies for using two bond guys in my stockpicking example, but i was blanking on equity managers. It&#8217s sad. The one common theme (except Hou) is the coaching turnover in each (obviously). Let&#8217s hope we found the guy to turn it around. It sure puts things in perspective.